Bowling us over with boredom. Namco Bandai finally released a Tekken game on the App Store, though it's very different from what we expected. 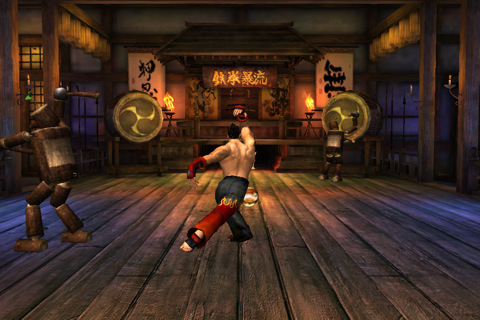 Instead of creating a portable brawler to compete with Capcom's Street Fighter, the publisher brought a watered down version of Tekken Bowl to the iPhone, a title so devoid of features you'll probably see everything it has to offer within a couple of hours, but hey, at least it's free. The game brings back fond memories of the bowling mini game in Tekken Tag Tournament, though it's nowhere near as much fun. You only have three characters to choose from (Xiaoyu, Jin and Panda), as well as three modes: ten-pin single player, a pass and play two player game and 30 puzzles to complete. The latter is by far the most interesting, as you'll need a certain amount of skill to knock down all of the pins to earn bronze, silver and gold medals. That said, Namco Bandai doesn't make this easy, since you must somehow guide the balls up ramps, across lava and into barrels of TNT, not exactly your average game of bowling. With this in mind, the publisher made a big mistake with the controls. Don't even think about swiping in one fluid motion; you know, to mimic rolling a ball. Here, you simply tap two meters that gauge how straight the ball travels and power. It's even worse in Puzzle mode, which asks you to drag an image of a balling ball to a specific area, letting your character do the actual work. It's a decent game overall, especially when you factor in the 30 Game Center achievements, but you can also find better Bowling titles on the App Store, ones that don't serve as a marketing vehicle for upcoming games and films (you'll find that info by clicking the Tekken Community button). To that end, Tekken Bowl falls short of greatness, but on the positive side, you won't lose anything other than time playing it. Requirements: Compatible with iPhone, iPod touch, and iPad. Requires iOS 4.1 or later. What's Hot: Free, 30 achievements, two-player mode, puzzles will keep you busy. What's Not: Disappointing controls, only three characters and modes to choose from.